Once again the science described here is early days. The explanations here are at best speculative. I simply do not see how someone can talk with such assurance about the effect of the ozone layer. Even that theory is and was speculative, yet the weight of time has allowed it to land in textbooks for the last generation of young scholars to accept. This is why there is a fight to stuff creationism into textbooks. The empirical fact is that the Antarctic appears to have cooled over the same time span as the north has warmed. Our data gathering has only become good enough in the past three decades to even begin to make tentative guesses. If I were to make a conjecture at all, then I would propose a natural mechanism that rebalances the two sides of the equator. It would need to be an ocean current stimulated by the increasing amount of cold water. If that conjecture were to hold up, then we likely have one to two centuries to wait. I do not think that any other mechanism is convincing unless they are not linked at all and that seems unlikely. But once linked, I need no other theory to settle things except to say that in the natural course the south gets colder and the north gets warmer until a tipping point is reached. In the meantime it is all well masked by atmospheric activity. And if I need no other mechanism than the biggest and strongest, why look too hard? We will need to learn the nature of this mechanism and estimate its likely timing. I am becoming more and more comfortable that the little ice age was brought on by an unusual injection of deep Antarctic water into the South Atlantic that cooled the Gulf Stream. Ozone depletion has caused more intense low pressure systems (shown in blue) to develop over the Amundsen and Ross Seas, while higher pressure systems (red) have developed on the periphery of the Southern Ocean. Ozone loss has likely strengthened the cyclonic wind flow across the Ross Ice Shelf and made winds cooler and stormier. Such changes can increase sea ice extent by pushing ice offshore and maintaining coastal polynyas (inset), areas of open water that tend to produce and export sea ice rapidly. Global temperatures are increasing. Sea levels are rising. Ice sheets in many areas of the world are retreating. Yet there's something peculiar going on in the oceans around Antarctica: even as global air and ocean temperatures march upward, the extent of the sea ice around the southern continent isn't decreasing. In fact, it's increasing. Sea ice at the other end of the world has been making headlines in recent years for retreating at a breakneck pace. Satellite measurements show that, on average, Arctic sea ice has decreased by four percent per decade since the late 1970s, explained Claire Parkinson, a cryospheric scientist at NASA’s Goddard Space Flight Center in Greenbelt, Md., who has been tracking the movements of the ice for 30 years. Antarctic sea ice, in contrast, has expanded northward by about 1 percent - the equivalent to 100,000 square kilometers (38,610 square miles) - per decade. Why is there such a drastic difference in the behavior of the two poles? Scientists from Goddard and the University of Washington, Seattle, recently described three theories – ozone depletion, changing ocean dynamics, and the flooding of sea ice - for what's happening in the Southern Ocean around Antarctica. In the 1980s, scientists discovered that emissions of refrigerants and accelerants called chlorofluorocarbons (CFCs) had depleted the ozone layer, especially over Antarctica. Ozone depletion, notorious for permitting more cancer-causing ultraviolet light to reach the surface, has a lesser known impact: It cools the stratosphere, the layer of atmosphere between 10 and 60 kilometers (6 and 37 miles) above the surface. Since the ozone hole began developing, researchers believe the Antarctic stratosphere has cooled between 2 degrees C and 6 degrees C (3.6 degrees F and 10.8 degrees F). Such cooling changes the dynamics between the stratosphere and lower layers of the atmosphere and strengthens Antarctica's already fierce winds. Ever since mariners first attempted to navigate the Southern Ocean, the region has been notorious for its powerful and stormy cyclonic winds during the winter. The "polar vortex" whips around the Southern Ocean and produces sustained periods of freezing temperatures unlike any other place in the world. Since 1980, the strength of the polar vertex has intensified by about 15 percent due to ozone depletion. The loss of ozone caused atmospheric pressure to decrease over the Amundsen Sea, thereby strengthening the winds on the Ross Ice Shelf, according to NASA Goddard scientist Josefino Comiso, coauthor of a recent study that models the connection between ozone, wind speeds, and climate in the Antarctic. The changes help explain one of the paradoxes of the Antarctic: while sea ice in some areas is growing rapidly, it's retreating at a rapid pace in others. The new model suggests that colder, stormier, and faster winds are rushing over the waters encircling Antarctic - especially the Ross Sea, where ice growth has been the most rapid. The winds create areas of open water near the coast - known as polynyas - that promote sea ice production. At the same time, warmer air from higher pressure systems are simultaneously encroaching upon the Antarctic Peninsula, one sliver of the continent that is experiencing rapid warming. 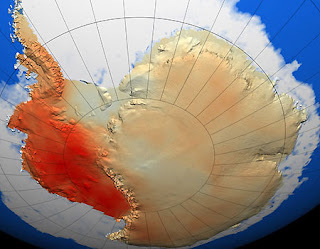 "We see a very mixed pattern of both melting and ice growth in the Antarctic," said Thorsten Markus, head of NASA Goddard's Cryospheric Sciences Branch. "Changes in the cyclonic pattern due to the ozone hole are one of the best explanations we have." Changes in ocean circulation may also play a role. Jinlun Zhang, an oceanographer at the University of Washington, has pieced together a complex computer model that helps explain why Antarctic sea ice is expanding even with signs that ocean and air temperatures are on the rise. The key is that warming temperatures can lead to more stratified ocean layers. In the Southern Ocean, there's a layer of cold water near the surface and a layer of warmer water below. Normally, convection causes the two layers to mix and exchange water, a process that brings heat from the lower layers to the surface layer and ultimately helps keep sea ice expansion in check. This transfer of heat is the primary reason that first-year ice in the Antarctic is much thinner than in the Arctic. But if global air temperatures warm, the model indicates that the amount of rain and snowfall could increase, and surface waters could freshen. Since fresh water is less dense and less apt to mix with the heavier, saltier, and warmer water below, the layer at the ocean's surface could become more stratified and mix less. This, in turn, would reduce the amount of heat flowing upward, allowing surface ice to expand. Field measurements suggest that there has been a marked freshening of some parts of the Southern Ocean. Researchers from Columbia University, New York City, have detailed a freshening in the Ross Sea, and a recent study shows that the Antarctic-Australian Bottom Water has freshened somewhat since the mid-1990s. Still, Zhang cautions that scientists can't yet say without qualification that all of the Southern Ocean is freshening. "Though the limited data available does suggest wide-scale freshening, we need more data to confirm this," he said. NASA's Aquarius instrument, which will launch on Argentina's SAC-D satellite in 2010, will perform global measurements of ocean salinity and should help provide such data. Water-logged sea ice is the third phenomenon that may explain why sea ice in the Antarctic is increasing. The process, which scientists call "snow-to-ice conversion," occurs when the weight of accumulated snow presses down on a slab of sea ice until it's nearly submerged. When that happens, waves cause ocean water to spill on top of the ice and into the snow, forming a layer that eventually freezes and becomes "snow ice." "You can add eight-to-ten centimeters to the thickness of sea ice each time this happens," said Markus. Though this process doesn't directly affect sea ice extent as observed over short time periods, some scientists believe it may have an impact on ice extent over the course of a full season. Ice formed in this manner isn't easy to distinguish without performing tests on isotopes, yet scientists believe thickening from snow ice is ubiquitous around Antarctica. Researchers have discovered it on Antarctic pack ice in all regions and during all seasons, with the most snow ice formation occurring in the Eastern Ross and Amundsen Seas. One study suggests that snow-ice constitutes as much as 38 percent of the sea ice mass in these areas. However, such numbers are difficult to pin down definitively, given the complexities of field research in the extreme conditions of the continent. "We've made some progress," said Markus, "but in the next few years, I think we're going to see much more detailed measurements of the flooding of the snow-ice interface."